In an effort to give our customers the best quality products and service, H.B. Steele & Son is offering a line of different fuel and lubricant options for our loyal customers in the Schuylkill County area. 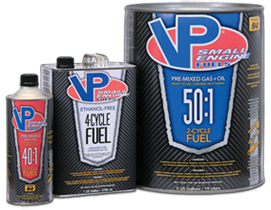 VP is now recognized by many as the world leader in race fuel technology, with a catalog of nearly 70 fuel blends and a growing roster of VP-fueled champions across the entire spectrum of motorsports. VP’s reputation for product quality, along with superior service and technical support, helped secure its position as the Official Racing Fuel of the largest racing sanctioning body in the world-NHRA Championship Drag Racing-as well as sponsor of nearly 60 other series and sanctioning bodies, including American LeMans, American Drag Racing League (ADRL), AMA Supercross, Star Mazada, World of Outlaws Sprint Cars and World of Outlaws Late Models among many others. Take the best care of your small engine with VP. Known as a world leader in race fuel technology, VP has a reputation for quality, superior service and technical support, and is the Official Racing Fuel of the NHRA Championship Drag Racing. In order to supply the best quality lubricants, H.B. Steele is now an authorized dealer of AMSOIL synthetic lubricants, which is not only sold to our beloved customers, but used on our own commercial fleet of vehicles as well as our personal equipment. This complete line of quality products is recognized by countless private motorists, fleet managers, and industrial administrators as the best and most cost-effective choice for increasing engine performance, reducing maintenance and prolonging vehicle and equipment life.